When you need to work with images and segments of a video after production, you need the best functionality you can get. Deframe is a video post-production utility that gives you an easy way to extract and repurpose the images and segments within your video assets. The 2.0.1 Update is a major update that introduces a new user interface, new data types and a new workflow. We have added lots of new features to Deframe to make it a more effective tool for videographers, editorial production staff and corporate media professionals ... With this release, we concentrated on simplifying the most frequent task associated with each type of extraction. We reworked the user interface, using a dark theme to make long "deframing" sessions more comfortable. And, we've introduced new types of extractions and beefed up interoperability making it easier to share data between Deframe and other applications. Multiple Extraction Types Extract parts of your movie as either an image or a video clip; or organized as extractions on a contact sheet or as a segment summary. Interoperability Drag'n drop (or copy) high-resolution images directly from Deframe to your application. Summaries Create a single picture that captures the range of images within a movie segment. Contact Sheets Make a PDF document with a collection of images from your movie's timeline. 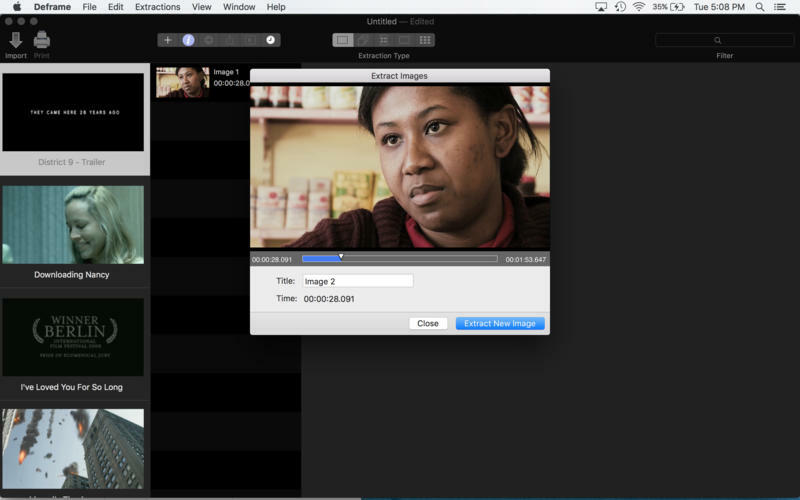 Exporting Create new movie clips in a variety of formats for a range of devices and playback situations. Printing High-resolution source material may be printed as a single image, on a contact sheet or as image slices. Slide Shows Create an interactive presentation from your movies using images, contact sheets and summaries. Charlotte, North Carolina - einstein's legacy makes cool Macintosh Applications for video, images and quartz compositions for creative professionals. einstein's legacy v2.0, LLC is located in Charlotte, NC. Copyright (C) 2011-2016 einstein's legacy. All Rights Reserved. Apple, the Apple logo, Macintosh, iPhone, iPod, iPad and Mac OS X are registered trademarks of Apple Inc. in the U.S. and/or other countries. Other trademarks and registered trademarks may be the property of their respective owners.